Over the last few weeks I’ve been getting more interested and more knowledgeable about mapping on my new Garmin, having previously been through the pain of creating and installing my own custom icons. After a discussion made during a long walk around Rutland last weekend a friend asked me how I have managed to install Ordnance Survey maps at 1:25000 onto my Garmin using Garmin’s BaseCamp tool. The issue is, you see, that on my Montana the onboard storage for the GPS is about 4Gb, which doesn’t leave a huge amount of room for maps, especially if you’re a hoarder like me and want to have absolutely everything you’ve ever bought available all the time. So I needed to figure out how to load my custom maps onto the Montana’s MicroSD card – I bought a 32Gb MicroSD card for some trivially small price off Amazon. When I got the Montana it came installed with the Garmin base maps, but these are next to useless for Geocaching. Following a few links on Facebook and elsewhere I ended up buying TalkyToaster maps, which are based on OpenStreetMap. These are fairly cheap but I did find the style to be a bit heavy looking on the screen of the GPS, so I wasn’t over keen on using them for “big” days out. So now I have switched over to two different mapping layers, depending on what I’m doing. BirdsEye Select OS 1:25000 maps for days when I’m going on a splurge – Obviously these cost £20 for a 1500 square kilometre block, but you can have as many different blocks as you want, and once the credits are paid for they stay on your account for a year or so, hence there’s no urgency to spend it all at once. It is available at the same level of detail (and usable in both BaseCamp and on the GPS) for around 28 different European countries. They also offer some bigger-area, less-detail versions too, but I went through the pain of downloading all 28 sets and installing them, and they seem to work well. Select the country (or countries) you want and download them – ensure you pick the “Install Image for MicroSD Card” versions, but if you want to use them in BaseCamp there are separate files for those. I’m not going to cover that here though. The download copies down a ZIP file called <LND>_en_gmapsupp.img.zip – where <LND> is the name of the country concerned, e.g. GBR for Great Britain. On some of them the “en” part is a “de”, presumably meaning that the map is in German not English. This applies to all the German speaking countries (Germany, Switzerland and Austria). All the others came in English. If you are going to install more than one country on your device then you’ll need to rename these image files individually to gmapsupp_BEL.imp, gmapsupp_GBR.img, gmapsupp_DEU.img, and so on. Once you have your gmapsupp.img files, connect your GPS to your PC and wait until it starts in “mass storage mode” – i.e. you can see the device and the MicroSD card in the list of “disks” in File Explorer. Copy the gmapsupp.img files and paste them onto the MicroSD card device in the GARMIN folder. Disconnect the GPS from the PC and switch it on. Here’s a pretty picture of what Freizeitkarte image files look like in BaseCamp. You can see the level of detail in the window on the right and can see how my “dashboard” looks with the Freizeitkarte and BirdsEye entries installed. I’m not going to go through the process of explaining how to set up a Garmin account, install BaseCamp or actually buy some BirdsEye credits because all of those are covered elsewhere. The key question to answer is how to install the things on your MicroSD card rather than in the GPS devices’s onboard storage once you have it. When you buy the map extracts and download them, they download into a semi-hidden folder structure that BaseCamp installs, but they will also appear on your dashboard window at the bottom left of BaseCamp when you have the “My Collection” item selected at the top left. You will have this selected, because the maps won’t download if you don’t. Look at the picture below. You can see the list of my downloaded BirdsEye extracts on the bottom left and you can see my GPS at the top left – particularly notice the Montana unit, beneath which is “Memory Card (N:)”, beneath which is a “User Data” folder – this is where the BirdsEye maps need to go. When you are downloading the map extract into BaseCamp you’ll see a tiny checkbox asking if you want to “Install onto the GPS when download finishes” – ensure this is not checked. It will copy the image onto the GPS’s onboard storage. So when you have a screen looking something like the image below, you can simply drag-and-drop the relevant BirdsEye file (from the bottom left) onto the “User Data” folder – the image file copies over. When you do this you will see a file with a “.JNX” ending installed onto the \GARMIN\BirdsEye folder of the MicroSD card (you can see it in File Explorer but not in BaseCamp). I make safety copies of the “.JNX” files somewhere on my PC’s hard drive too, just in case the MicroSD or GPS crashes at some point. If you do accidentally install the BirdsEye maps into the GPS’s onboard storage then you can find the same “‘.JNX” file in the GPS device’s\Garmin\BirdsEye folder, so you can simply move it to the MicroSD card and delete from the onboard storage if you want to. The map below shows an installed bit of the BirdsEye Select map (for Marsh Gibbon) overlayed onto the Freizeitkarte map for the UK. My GPS does the same. Somehow it knows to use the BirdsEye map if there is one, and the Freizeitkarte if there isn’t. 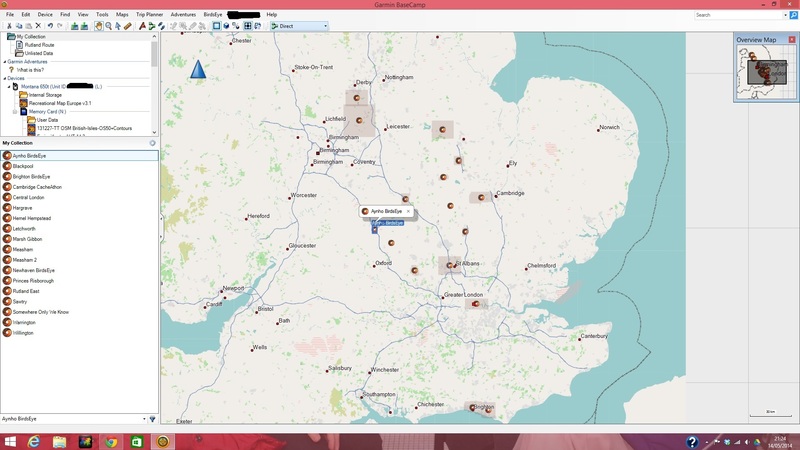 This final picture shows and overview of the UK with all of the areas I’ve downloaded from BirdsEye. The amount of entries and coverage shown here is about 2000 square kilometres. And yes, you can tell from this picture exactly where I’ve been caching since Christmas. Since I got the Garmin Montana 650t at Christmas I’ve used it a few times for geocaching but one of the things I’ve been finding difficult is the icons it uses for displaying caches on the map. The main problems I found are that they seem to be a little small, and a little indistinct. The “Unknown” cache icon is particularly hard to see against a busy map background. So I thought I’d experiment a bit to see whether it’s possible to change the icons that it uses for each cache type. The obvious first stopping off point was Google. In this instance, it proved to be a double-edged sword, as it often is. There are as many articles available that tell you it’s impossible as there are articles that show you how to do it. Many of the things I found were designed for users of the Garmin Oregon, an older and hence more mature product than my Montana. Some of the articles I found were in direct conflict with others. Also most of the articles I found were talking about custom icons that could also be shared with Garmin’s BaseCamp PC tool for displaying caches. I experimented a little bit with that but eventually concluded that BaseCamp sees geocaches as a different “kind” of waypoint to all other kinds, and therefore for some reason it doesn’t seem possible to simply add another icon for it to use. You are stuck with a closed wooden chest, or an open chest full of shiny gold coins, both of which appear on the screen at roughly the same size as Arkansas. Suffice to say my experiences of BaseCamp so far aren’t brilliant, and so I don’t think I’m going to be using it much. Back at the plot, this blog post is for the benefit of anyone else who may be in the same situation, and who may want to attempt the same thing. It describes how I did it, and more importantly, some things that definitely caused me a problem. In fact, I won’t go into any detail on the basics of how to create image files or move them around or whatever. Just the key bits I did to customize the icons on my Montana 650t. There are multiple sources of technical information on such matters and, quite frankly, if you don’t already know how to move files between your PC and your GPSr in mass storage mode then I wouldn’t even vaguely attempt this. And I make no guarantees this will also work on your GPSr, and I haven’t tried it out on any other device (because I haven’t got any others). But it does work on mine. Enough of the waivers and general excuses. On with the clever bit. The Montana allows various aspects of “user” data, which includes all your caches and maps, and also custom icons. Custom icons do not replace the default ones in the Garmin’s storage system – it has a hierarchy of folders that it checks through, and the custom folders are checked before the default ones. So you shouldn’t need to uninstall anything. Most modern Garmins have internal flash memory (built into the device) and also use a MicroSD card installed somewhere in the battery recess. User data can go onto either of these. I spent a lot of time reading this one – http://garminmontanagpsr.wikispaces.com/Custom+Waypoint+Symbols – the names of folders and so on are all correct. The process for allocating custom icons in BaseCamp seems correct. It is a little thin on explaining how to replace the icons for different cache types on the GPSr device but it contained enough information to get me most of the way through the course, as it were. This article got me excited – http://forums.gps.org.nz/viewtopic.php?f=3&t=7855 – partly because the icons used look straightforward and clear (this is why the guy did it), and partly because it’s fairly clear. Plus you can download a ZIP file of his icons to use as a start point for your own, which is precisely what I did. So what’s the process ? And “why doesn’t he just get on with it?” I hear you cry. Fair enough. To start with you need a set of icons to replace on your GPSr. Here’s what to do. Waypoint icons must be stored as BitMap (.bmp) files with a colour depth of RGB 8-bits per channel. I started with the ones from the forums.gps.org.nz article listed above. I also nicked a couple from the Groundspeak site because I wanted my Earthcaches to look like Earthcaches and my finds to look like smilies – getting them from the Groundspeak site is not so easy – go into your list of finds, do a “View Source”, and then search the text for a particular cache type, and you should be able to see which tiny image it uses. Groundspeak renders them as low resolution .GIF files, so they need to be converted and re-saved in your image editor to RGB 8-bit per channel bitmap files. They must be no larger than 32×32 pixels in size. In practice, 32 pixels is a big chunk of your screen. Mine are mainly 16×16 or smaller. If you want them to be picked up by the GPSr unit as the icon for each specific cache type then they have to be named in a certain way. The file to be shown for puzzle caches MUST be called “Unknown Cache.bmp”, for instance. If the names for your custom icons are wrong then the GPSr will just use the default icon for that cache type. 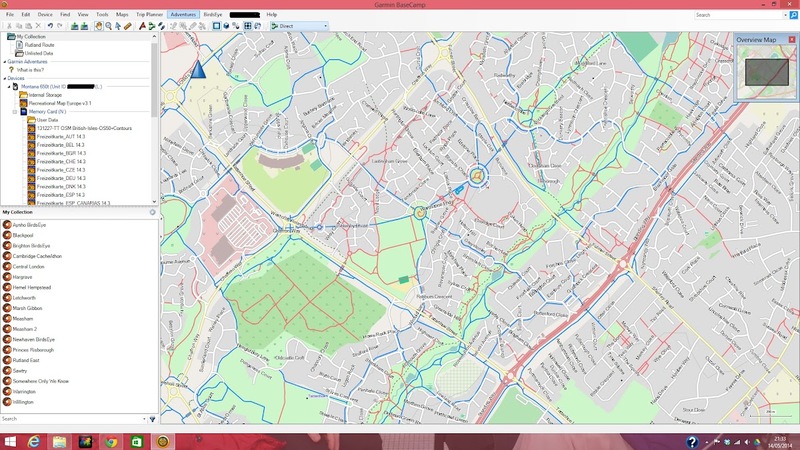 For those of you in the UK who like to do a few YOSMs there is no default icon for a “Geocache|Benchmark” type cache – which is what the GPX file distributed by YOSM.org.uk gives you. However geocaches of indistinct type use an icon called “Geocache.bmp”- If you download all your caches from PQs or from GSAK then they will all be listed as one of the “known” cache types. So I fixed the problem by creating a picture of a benchmark (well, a mini-Stonehenge) and naming this “Geocache.bmp” – the YOSMs are the only items on the GPSr that are NOT one of the standard types, and hence the only waypoints that will pick up this icon. I don’t have icons for Lost & Found Event, Block Party or Groundspeak HQ either, but that’s not likely to cause me a problem any time soon. Edit the icon files in your favourite picture editor. If you want a part of the image to be transparent on the GPSr you colour the relevant pixel in pure magenta (RGB 255,0,255 or #FF00FF). The GPSr ignores this colour. So if you wanted all your icons to be in bright magenta you’re scuppered. Once you have the icons ready you can install them on your device. You’ll be surprised how easy this actually is. Connect your Garmin to your PC in mass storage mode (i.e. so the PC sees the GPSr just like any other drive/storage). Create a folder in called \CustomSymbols under the \Garmin folder on the Garmin’s internal memory – do NOT try to do this on your MicroSD card. When I did it on mine the GPS would not start up nor connect to the PC. I had to physically remove the MicroSD card from the GPSr and then insert into the PC and manually delete the icon files again. STOP PRESS…When I updated the package below to include the “Final location.bmp” file I experienced the same “failure”, only this time it was on the internal memory. As I was going through the “factory reset” process documents for the Montana it somehow righted itself and everything was once more sweetness and light. It is possible that my only failure was impatience, and I should just have waited longer while something on the device reset itself to accommodate the new icons. Maybe. Copy your icon .bmp files into this folder. Disconnect the GPSr from the PC and switch it on. So here’s a few pretty pictures showing how it looks. On the Aynho picture notice the maps also are showing the OS 1:25,000 scale you get if you invest in some of the BirdsEye Select maps from Garmin, rather than the TalkyToaster maps I’m using for the rest of the UK. 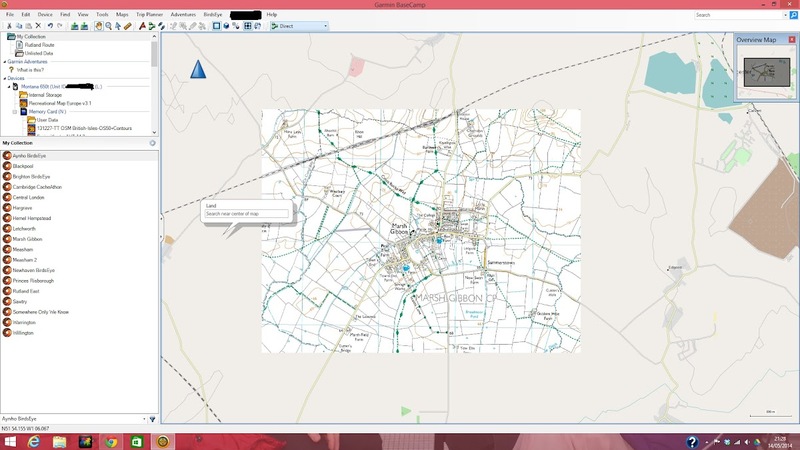 On the Silverstone picture you can see an example of the Benchmark icon for the YOSM there. You should also notice tiny icons for “subsidiary” waypoints like parking, question to answer, reference points, stages of a multi, and trailhead. And for these two you can see a good selection of icons on the Steeple Claydon picture, and an example of the Earthcache one on the Earls Barton picture. And here’s a download package of the icons I’m using now.